Recognizing the value of sports in the development of young people, Big Train founders John Ourisman and Bruce Adams established the Bethesda Community Base Ball Club in 1998 with a mission to improve the condition of youth baseball and softball fields in Montgomery County and the District of Colombia. Building a ballpark for a summer college baseball team was the first step. The concept was like Paul Newman making salad dressing and using the profits for good causes. Making baseball seemed like more fun. With dozens of community partners like Miller & Long, Sandy Spring Builders, and Hopkins & Porter, strong corporate support, and hundreds of donations from local baseball fans, we made nearly $1.5 million of improvements to the 90' diamond in Cabin John Regional Park. To keep alive Washington's baseball past, we named the team after baseball's greatest pitcher, Walter "Big Train" Johnson, and the field after legendary Washington Post sports writer Shirley Povich. 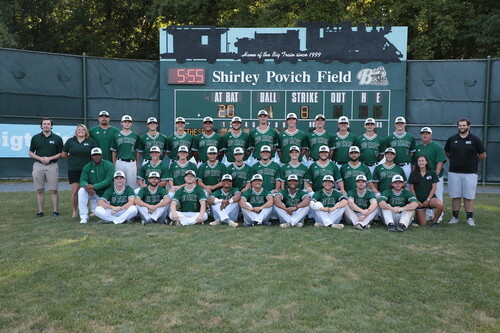 Nearly one-quarter million people have enjoyed Big Train baseball at Povich Field since opening night on June 4, 1999. Povich Field was just the beginning. Over the next 14 years, the Bethesda Community Base Ball Club contributed nearly $600,000 to improve youth fields from Bethesda to Anacostia, Rockville to Takoma Park, and Germantown to Wheaton. In 2002, we played a lead role in building a miniature Povich Field for youth players in Cabin John Regional Park. One young BCC Baseball player seeing the field for the first time pretty much summed up the feelings of all his peers: "SW...E...E...E...E...T!" In 2003, Sharon Robinson joined Mayor Anthony Williams at Kimball Elementary School in Anacostia to dedicate Jackie Robinson Field in honor of her dad. This was just the first of several abandoned fields we turned into community jewels in the District of Colombia to support the Fields of Dreams youth afterschool baseball and character education program. Montgomery County is the special place it is today because of the wonderful nonprofit organizations that support our neighbors in need and add to our quality of life. Each season, the Big Train showcases about forty local nonprofits. Each Nonprofit of the Night is given 100 free tickets to give to volunteers or sell as a fundraiser, is provided a table to display materials, and has a spokesperson give a short pitch about the organization before throwing out a first ball during pre-game ceremonies. The Nonprofit of the Night program has been supported by grants from the Jim and Carol Trawick Foundation since 2009. In addition, the Big Train has donated Family Season Passes to local schools and community groups since 1999 to help with their annual fundraising. Since 2010, the Montgomery County teams in the Cal Ripken Collegiate Baseball League have competed in an Annual Feed the Hungry Challenge. Each team sends players to two area Giant Food stores. The winning team is the one that collects the most food for the Manna Food Center, Montgomery County's food bank. Since the Feed the Hungry Challenge has began 53,171 pounds of food has been collected. Each year, Big Train volunteers participate in Montgomery County's two major days or service. Each January, Homer the Big Train mascot entertains volunteers at the annual Martin Luther King, Jr. Day of Service event. On Community Service Day each October, Big Train volunteers help clean up Povich Field by taking down and cleaning banners, raking leaves, and preparing the flower beds for the winter. Community service is a requirement for high school graduation in Maryland, and hundreds of student volunteers have logged more than 28,000 student service learning hours working at Povich Field. For many of our community's youth, volunteering at Povich Field has been their first community service experience. Big Train mascots Homer and Bunt make scores of appearances at neighborhood events throughout Montgomery County each year. Big Train players have joined the mascots at local libraries to promote summer reading and at community events like Miracle League. To invite Homer to your community event, please him at homer@bigtrain.org. Since 2001, Big Train baseball has been collecting used sneakers and baseball equipment for kids in the Dominican Republic. The original request came from Los Angeles Dodger Manny Mota and his wife Margarita whose Camp de Suenos serves kids in one of Santo Domingo's poorest neighborhoods. To ensure that Big Train baseball will continue to flourish for generations to come, the Bethesda Community Base Ball Club turned the Big Train baseball program over to the well regarded BCC Baseball youth organization in 2012. Established in 1993, BCC Baseball serves 2,000 youth players each year with organized leagues for players of all skill levels from ages 4 to 18. BCC Baseball currently maintains 23 ballfields in Montgomery County. During its two decades of service to the community, BCC Baseball has invested more than $3 million improving school and park fields.